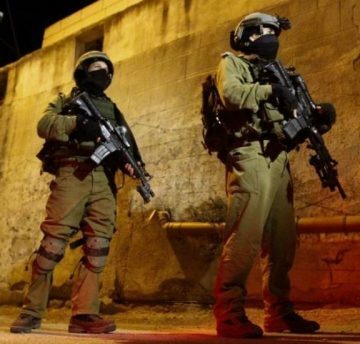 The Palestinian Prisoners’ Society (PPS) has reported that Israeli soldiers have abducted at least nineteen Palestinians from their homes in several parts of the occupied West Bank, during extensive and violent searched of homes. The soldiers invaded many communities in several governorates of the West Bank, and interrogated many Palestinians while violently searching their homes before abducting nineteen Palestinians, including former political prisoners. Ala’ Shouli (former political prisoner), Nablus. Ahmad Hamadna (former political prisoner), Nablus. Mahmoud ‘Aseeda (former political prisoner), Nablus. Mohammad Eshteyya (former political prisoner), Nablus. Abai Hamada (former political prisoner), Nablus. Mohammad Taqatqa (former political prisoner), Bethlehem. Saqer Sameeh Jibreel (medic), Bethlehem. Mohammad Salhi, (Aqsa Mosque guard who was also attacked by the soldiers), Jerusalem.